This is a medical school in India, and the oldest to teach European medicine in Asia. It is located at Pondicherry, the capital of the union territory of Puducherry, in southern India. The institute commonly known as JIPMER has appeared as one among the top best 5 medical colleges in India and is roosted to become the worldwide giant in health sector. The institute was established in 1956 under Government of India and has been affirmed as an Institution of National Importance by a Parliamentary Act that is JIPMER, Puducherry, Act, 2008. Spread across 192.2 acre campus in an urban region of Puducherry (previously Pondicherry), JIPMER is about 170 kms away from Chennai. They are conducting JIPMER MBBS 2016 entrance exam on June 5, 2016 at 75 different designated centres in a computer based version. This national level entrance test is applied by around 1.5 lakh candidates with a desire to pursue MBBS from one of the most premium medical institutes in India. Every year Jawaharlal Institute of Post Graduate Medical Education and Research (JIPMER) invite applications from Resident Indian Nationals including OCI (Overseas Citizen of India) for admission to the various courses. But the entrance exam is commonly known for the admission to the MBBS course. 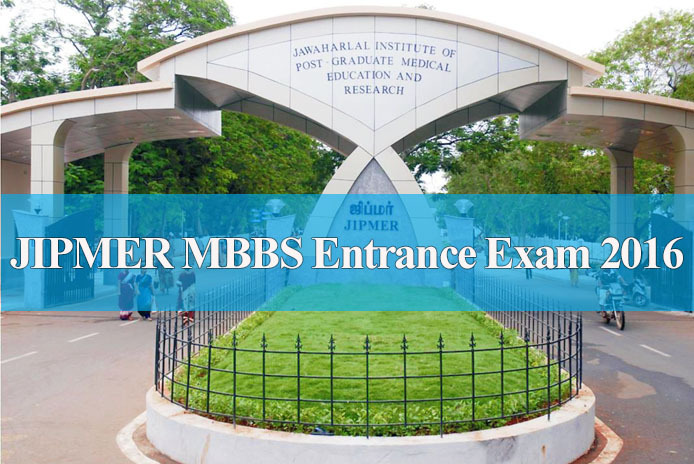 JIPMER MBBS 2016 Entrance Exam is conducted for admission to a total of 150 MBBS seats in JIPMER Pudducherry and 50 MBBS seats in Karaikal.The admission to 200 MBBS seats offered at JIPMER will be done strictly as per the candidate’s rank in JIPMER 2016. Candidates must have to meet the prescribed eligibility criteria at the time of applying for the exam to get admission in JIPMER MBBS 2016. Nationality:Candidates must be Indian nationals. Overseas Citizen of India (OCI) is also eligible for appearing in JIPMER MBBS 2016 entrance exam. The application form will be available from March 7, 2016 and last date for online registration is May 4, 2016. Candidates are advised to fill application form within the prescribed dates otherwise they will not be able to appear for the entrance exam. Candidates must note that the JIPMER MBBS application form will be available in online mode only. Candidates are advised to go through the prospectus carefully to ascertain the fact that they meet all the eligibility criteria before beginning the online registration for JIPMER MBBS 2016. It must be noted that no change in the details will be entertained once the form is submitted, therefore aspirant must be careful during the form fill up. Examination Fee:The cost of JIPMER MBBS 2016 entrance exam is Rs. 1000 for General, OBC and Rs. 800 for SC / ST category candidates. Stay tuned to www.besonline.in for more news and latest articles on JIPMER 2016.